Electric vehicles, a smart transportation choice. Electric Vehicles (EV) Cost Less To Operate Than Gas Powered Cars. EV operation can be three to five times cheaper than gasoline and diesel powered cars, depending on your local gasoline and electric rates. EVs have no tailpipe emissions. The power plant producing your electricity may produce emissions, but electricity from hydro, solar, nuclear or wind-powered plants is generally emission-free. Never Go To The Gas Station Again. 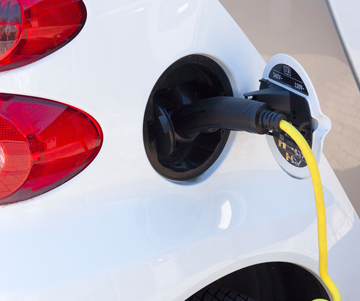 Electric vehicles do not require gasoline and can be charged at home with a standard 120V outlet or a 240V level 2 charger can be installed for faster, more efficient charging. Electric motors provide quiet, smooth operation, stronger acceleration and require less maintenance than gasoline powered internal combustion engines. EV Driving Range & Recharge Time. The City of Ashland is Committed to Carbon Reduction and Clean Air. This website is designed to provide you with information about electric vehicles and to help shape a healthy electric vehicle marketplace. The Pacific Northwest is an ideal place to own an EV as much of our power comes from hydroelectric and renewable energy sources. That means that when you drive an EV you are trading your fossil fuels (gasoline and diesel) for energy coming from dams, wind farms and in many cases solar power. While some of the electricity in the NW comes from coal and natural gas burning power plants and nuclear facilities, when you choose EV, you're likely using less fossil fuel than a traditional gas powered car. The Ashland City Council recently unanimously adopted a Community Climate and Energy Action Plan. The plan contains strategies for reaching defined goals and targets to reduce carbon emissions and adapt the community for anticipated local climate changes. Further, the plan is organized into six core focus areas, each with their own set of identified actions to meet the goals and targets set in the plan. Contact Adam Hanks at adam@ashland.or.us if you would like more information on the plan or its implementation.